When it’s time to decide what pages to promote through link building, do you have a solid strategy? Many of us have been trained to dig for good keyword ranking opportunities and base our SEO promotion strategies there. 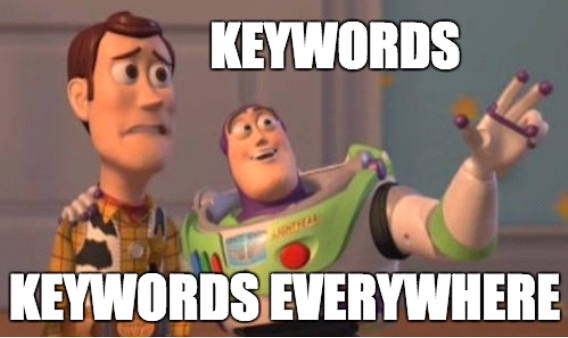 Do you have pages that are on the cusp of page one for a given keyword? Point enough links to there, and traffic will spike. It makes sense on a rudimentary level. But it doesn’t necessarily move you closer to the KPIs that impact your bottom line – capturing leads from visitors, and turning those leads into paying customers. To move those needles, you need to discover what content is already working for you, and then use those pages and their related keywords to drive your content promotion strategy. What’s Wrong with the Typical Approach? There’s a lot of good advice out there on how to choose what keywords to rank for: you can look for good ranking opportunities – those highly relevant keywords that you either don’t yet rank for, or don’t rankly highly on – and optimize your content efforts for them. Or you can try to hunt down viable long-tail opportunities, those highly specific keywords that don’t see huge search volume but are highly relevant to the user, and target those in your content. The prevailing advice says you should identify these kinds of opportunities, then create new content around them and optimize your content pages to help boost their rank. Most of that advice will work – when pursued diligently, you’re likely to start ranking nicely for those keywords. Here’s the critical flaw in this approach, though: It assumes that good keyword ranking drives you closer to your goals, and that’s not necessarily the case. Why not? Because for most websites, the goal is generating more leads, and converting those leads to sales. Simply ranking for a particular keyword is no guarantee that this is happening. Instead, let’s look at a data-driven SEO strategy that will move you closer to your real goals – lead generation and sales. On your website, it’s likely there are some pages that are working well to move these metrics, and some that aren’t. Let’s show you how to uncover that info. Take a few minutes now and determine which content pages, landing pages, forms, CTAs and other content elements are designed to support these conversions. In this section we’ll use your content analytics data to find the pages that are actually performing best to drive those metrics home. 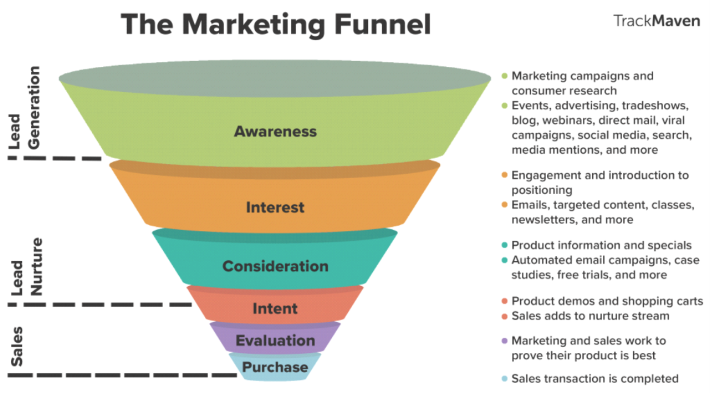 The goals you set up should help you understand where your customers are coming from and what content is bringing them closer to sales conversions. To understand how these goals are actually impacting your bottom line, the next step is to set up your goal values. Keep in mind that you’ll see the clearest results when you set up your goal value based on actual revenue associated with actual sales. This allows you to easily identify your top money making pages and their associated keywords. You might see people recommending that you use your overall conversion rates as a starting point and assign Goal Value according to averages. For example, if 1% of your new newsletter subscribers end up buying an average of $1000 worth of products, then you’d set the Goal Value for newsletter subscription conversions to $10. This practice is often useful, but if you want to identify the keywords and pages that are actually working right now to make you money, it’s best to use actual revenue values whenever possible. Ideally, you’d set up your eCommerce platform to sync with your Analytics account so you’ll have actually transaction data to work with, but at the very least, you should calculate your customer lifetime value and associate that dollar amount with the Goal Value for visits to your thank you page. So if your average customer spends $100 per order and places 1.7 orders over the course of his or her lifetime, then you’d set the Goal Value for checkout conversions to $170. 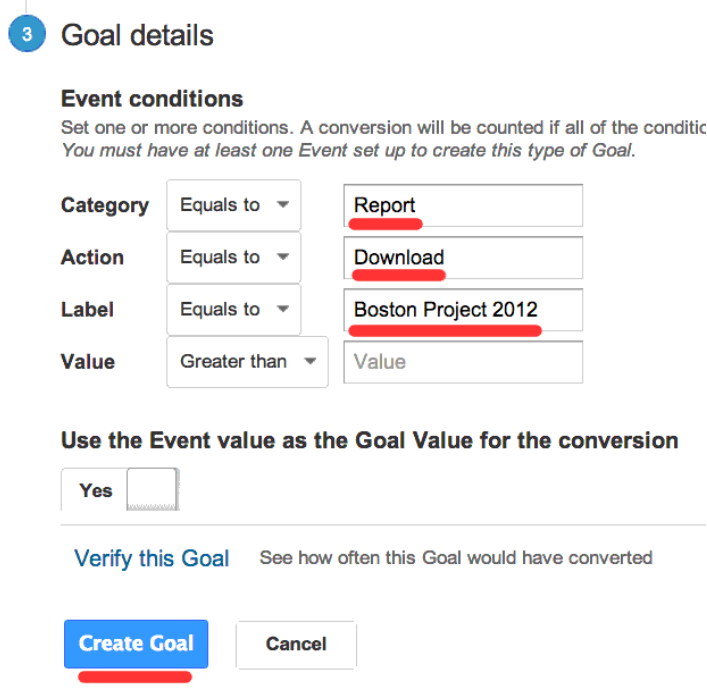 Once you’ve set up your event goals and values, you’ll be able to analyze the goal conversion rates and completions to know which pages are performing the best for you. 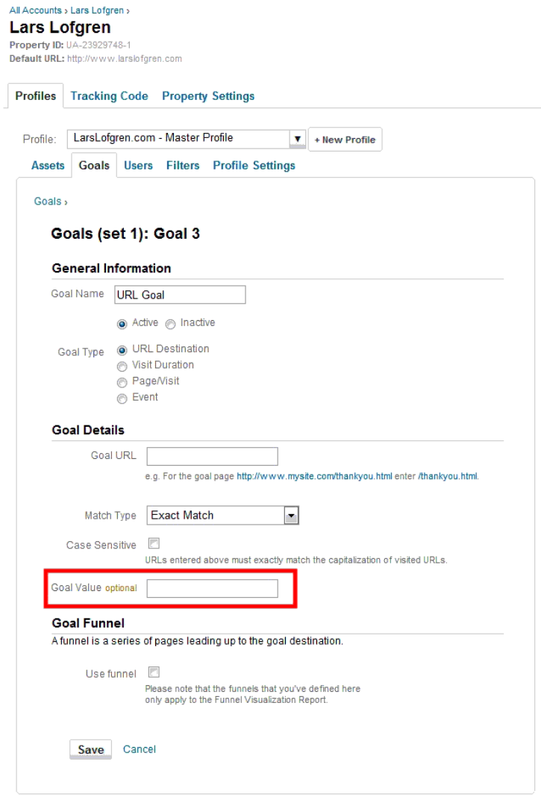 To get there, just go to Conversions > Goals > Overview in the left-hand navigation column and then click on “view full report” at the bottom-right corner of your screen. Finally, you’ll want to know what keywords are driving the traffic to these top-performing pages. To get this data, go to Behavior > Site Content > Landing Pages, and then look for your best performing pages. You’ll see the keywords from every single source that is driving traffic to each of those pages. For instance, to see the keywords that are coming from organic search via Google, you can use the segmentation filters to narrow your report view down to just that. Of course, in the age of [not provided], the keyword data here will be incomplete, but once you’ve identified the URLs of your “money pages”, you can use additional tools like SEMrush and Google Search Console to fill in those gaps. By determining and promoting the pages and keywords that perform best, you can strategically build on what’s working. Are rankings really what you’re after? Or are you looking to convert, either into leads or sales? Once you understand what metrics really matter, and what keywords are driving your lead generation and sales metrics, your SEO strategy takes on a whole new dimension. Instead of simply looking for ranking opportunities, you can focus on keywords and pages that are proven to drive business. Now, the decision on what content to promote becomes much easier and more effective, backed by data that offers proof. Focus your SEO strategy to promote those pages that are performing best for you.